Should a group booking require a reduction of numbers then the customer will incur a 15% charge in line with the reduction number. Should the group be a 'no show' then a charge will be levied equal to the charge for 1 nights stay in line with the size of the group. CK Hostel has a focus on customer service and atmosphere. 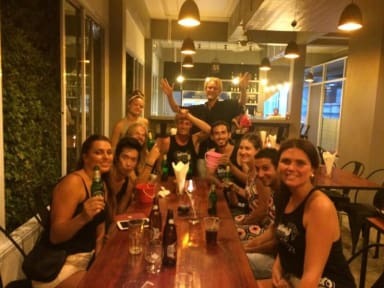 We are a fun and social hostel situated in one of the best locations on the island, Central Sairee Crossroads. With a variety of bars, International/Thai restaurants, shops and the beach within a 1-5 minute walk, this is the place to be if you want to be close to everything. The hostel itself contains 90 beds with a variety of both private rooms and dormitory rooms. Ranging from double rooms up to 18 bed dorms, all providing 24/7 AC, lockers and hot showers. In addition to this, the double private rooms also have a television, fridge and a private bathroom. The hostel is also one of the few hostels that provides both restaurant/bar and diving centre, in addition to accommodation. Our bar name "Fellow's" offers a wide range of low price alcoholic beverages with nightly drink specials, which makes it a good place to start off your night, or just have a few chilled beers after a long day scuba diving or chilling on the beach. - If you arrive before that and the room is available, we are happy to check you in earlier, as long as it is after 09:00am. 2. Check-out time is 11:00am. 4. Cancellation policy: If you want to cancel your booking, send us an email up to 24 hours before your original arrival time. 5. Our reception opening times are from 08:00am to 20:00pm. - Please send us an email beforehand if your arrival is outside our reception times so we can arrange something for you.